Robert Anderson, b. 1819 The Life of Rev. Robert Anderson. Born the 22d Day of February, in the Year of Our Lord 1819, and Joined the Methodist Episcopal Church in 1839. This Book Shall Be Called The Young Men's Guide, Or, the Brother in White. The Life of Rev. Robert Anderson. Born the 22d Day of February, in the Year of Our Lord 1819, and Joined the Methodist Episcopal Church in 1839. This Book Shall Be Called The Young Men's Guide, Or, the Brother in White. Macon, GA: Printed for the Author, 1892. African American clergy -- Georgia -- Biography. African American Methodists -- Georgia -- Biography. African Americans -- Georgia -- Biography. 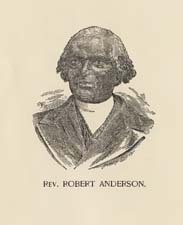 African Methodist Episcopal Church -- Clergy -- Biography. African Methodist Episcopal Church -- Finance. African Methodist Episcopal Church -- History. Free African Americans -- Georgia -- Biography. Georgia -- Description and travel. Methodist Episcopal Church -- Clergy -- Biography. Methodist Episcopal Church -- Finance. Methodist Episcopal Church -- History. Plantation life -- Georgia -- History -- 19th century. Slavery -- Georgia -- History -- 19th century. Slaves -- Georgia -- Biography. Slaves' writings, American -- Georgia. Hargrett Rare Book & Manuscript Library/University of Georgia Libraries and Trinity College, Hartford, Connecticut provided the text for the electronic publication of this title.